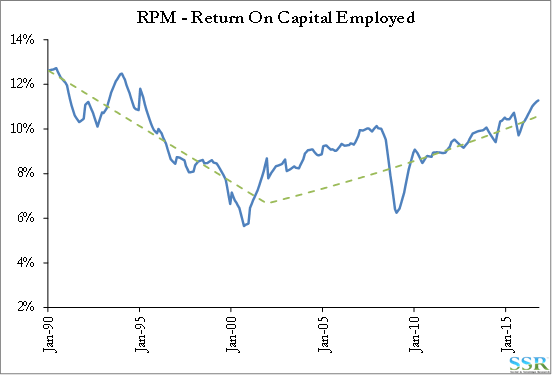 The housing/recession related dip in the late 2000s aside, RPM has been on an improving return on capital trend for the better part of the past 15 years. The stock had generally received the benefit of this over the past five years and remains on the expensive side (earnings more than justify the premium), but the recent selloff has the stock closer to fair value than can be seen clearly in Exhibit 3. We believe the dip in the share price creates an intriguing entry point – the company’s stability alone possibly warrants a multiple re-rating higher, and the company is also less exposed to the European problems that appear to have plagued PPG recently. 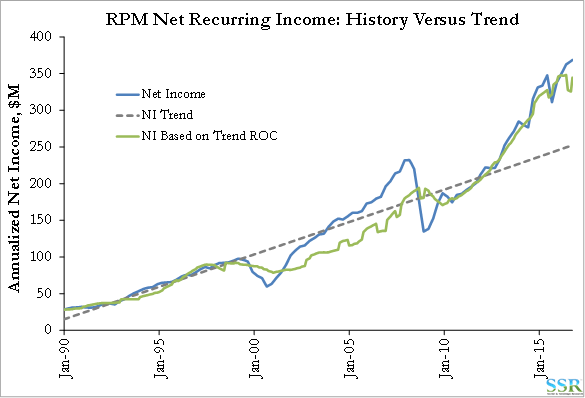 Exhibit 4 is a good representation of the housing bubble in the 2000s – RPM’s net income was above trend much of the decade until the bubble burst abruptly. 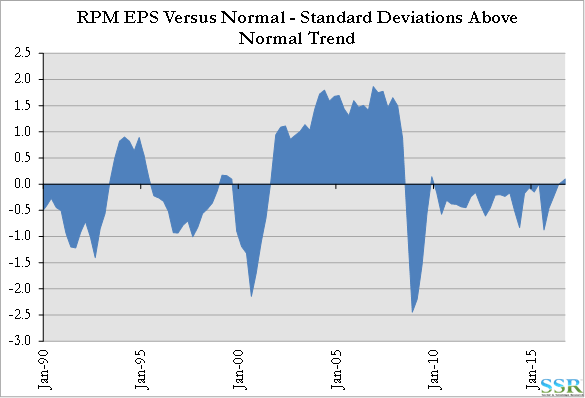 What happened next for RPM is perhaps more interesting – net income has largely followed a strong trend higher and the muted volatility relative to prior cycles is evident in Exhibit 5. The reduced volatility has not yet been reflected in the stock’s relative multiple – Exhibit 6 – which is a potential opportunity in our view. At SHW’s multiple, RPM would be a $73 stock, roughly 45% upside from the current $50 – today we would argue that RPM has much less transaction related risk than SHW, given SHW’s need to deliver on aggressive synergy and growth targets associated with the VAL deal. We think that the SHW model is good – it is just more than fully priced in today. 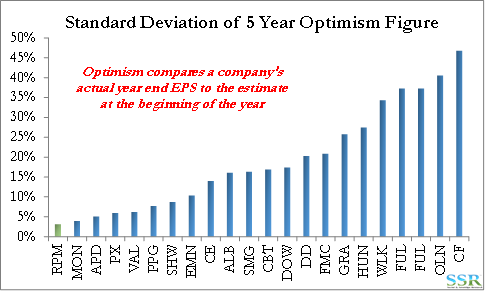 We can also express RPM’s stability in recent years in terms of our optimism framework, which measures the deviation of actual earnings from the (presumably company-guided) estimate at the start of the year. 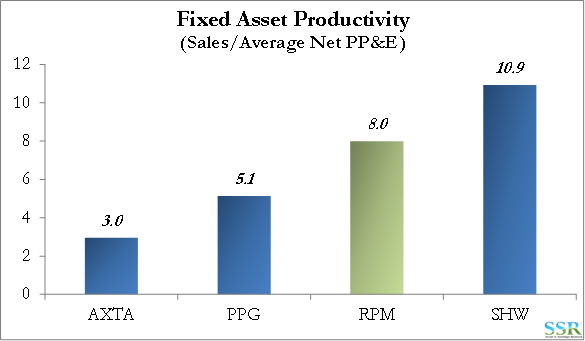 Exhibit 7 illustrates RPM’s impressive position in the Chemicals space and indicates that earnings have generally come in around initial estimates – this holds on both a fiscal and calendar year basis. No company looks this good on a 10-year basis because the 2008/2009 crash caught everyone by surprise. We don’t think that recent earnings guidance is a leading indicator to another crash (it could be, but the trigger is unclear) and that it is more likely an inventory correction associated with a number of end markets, like European and US Autos peaking. 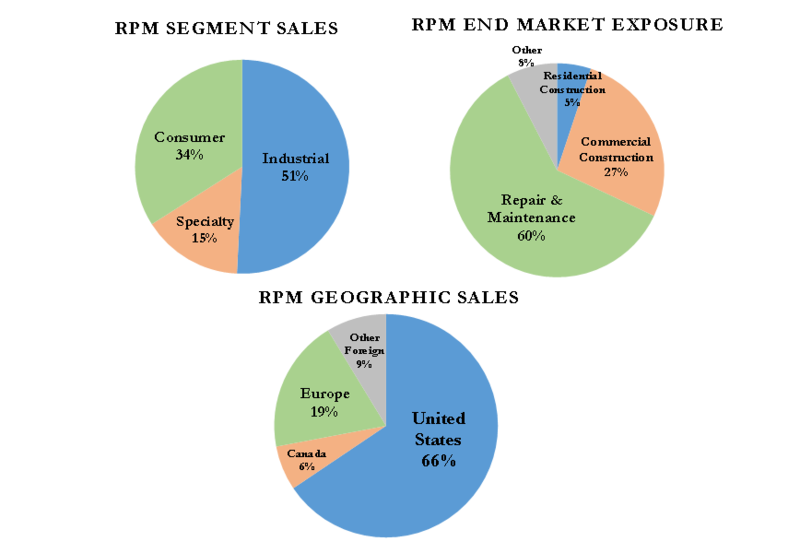 Exhibit 8 summarizes RPM’s sales breakdowns – the repair & maintenance and North American heavy exposures also indicate relative stability. 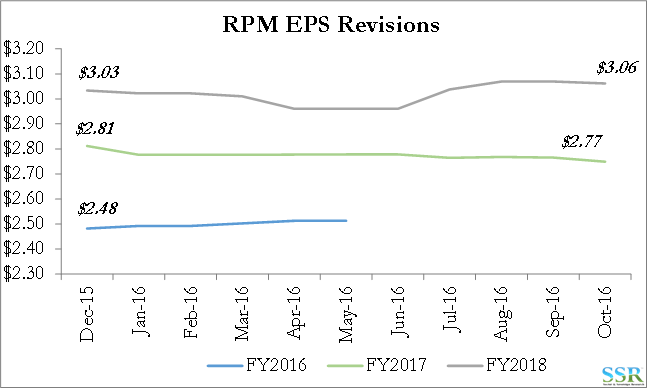 Efficiency metrics confirm RPM as a well-run company. 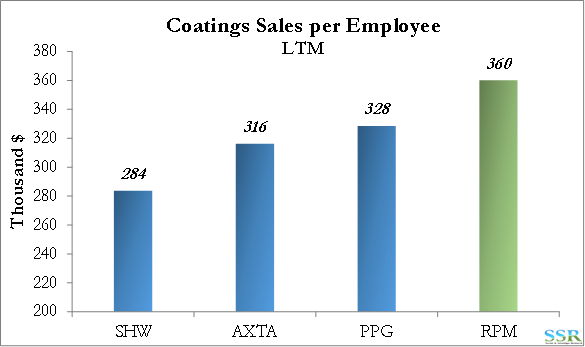 Sales per employee tops the Coatings space – Exhibit 9 – and RPM generates significant sales from its assets – Exhibit 10. Note that SHW’s model of leasing its branded stores likely inflates its figure in Exhibit 10. History of Bolt-On Acquisitions – Debt Levels Allow for More – Possible Takeout? RPM has grown in part through a series of bolt-on brand names, complimentary businesses which it has marketed through common channels, driving synergies – annual acquisition spending is summarized in Exhibit 11. 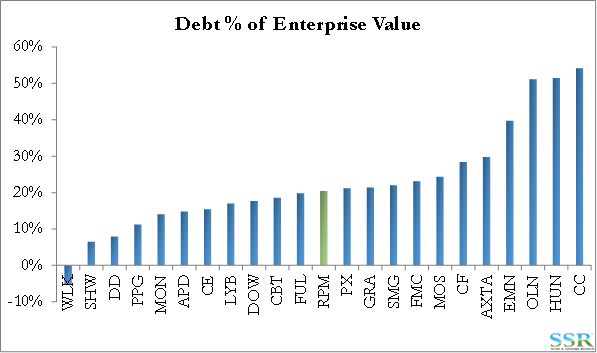 Debt levels are high relative to Coatings peers (Exhibit 12) but not at a level of concern, particularly relative to the wider Chemicals sector. 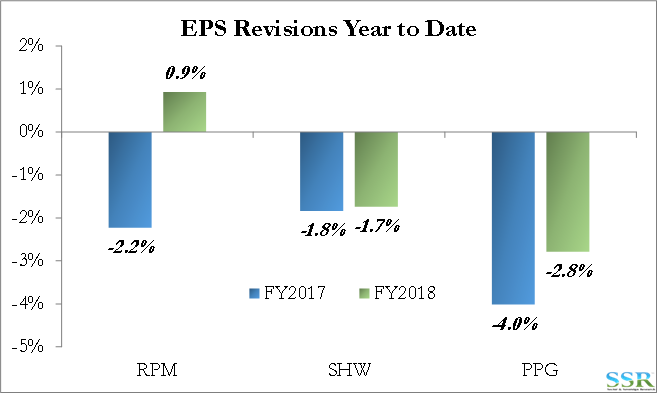 Future bolt-on deals are part of RPM’s stated strategy and one scenario is that the company continues down its recent path and that the earnings growth and dividend growth can be supported by this strategy. The company is a complex array of brands and a potential takeout multiple may be prohibitive but there has been strong appetite for M&A of late in the broader sector and nothing appears completely off the table. Maximum synergies would come from a company already well aligned with the big box home improvement retailers and trade and industrial channels – post the VAL deal, SHW could be a good fit but may not pass a regulatory review. 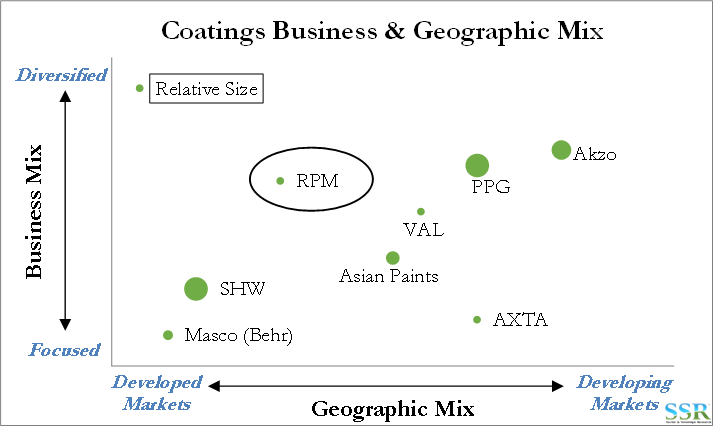 PPG could derive a lot of synergies here, and the recent earnings warning may encourage PPG to diversify within the US rather than outside. This is a business that might fit within the Berkshire Hathaway portfolio and might be a way to make Benjamin Moore a better platform. 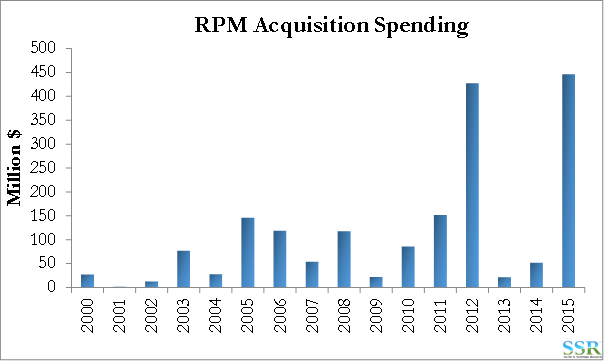 There is also a potential DOW/DD split/sale entity which might consider RPM as an interesting add on. 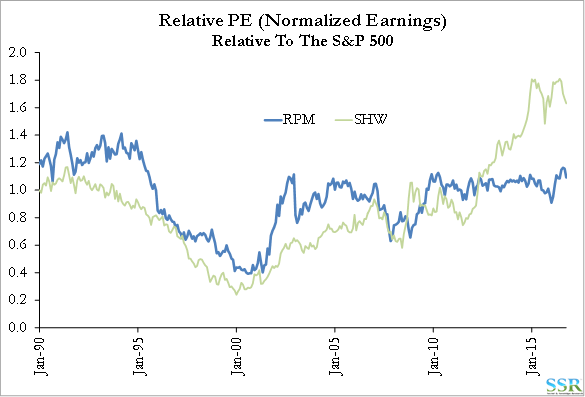 We accept that a rising rate environment might make the “bolt-on” and broader industry consolidation harder and that it might place less attention on higher yielding stocks, but higher rates bring other issues for the sector from a valuation perspective and it is not clear that RPM would fare any worse on a relative basis. Exhibits 13 and 14 show how stable RPM’s estimates are and also compare what has happened recently at RPM, SHW and PPG – note that both PPG and RPM have released information to the market in the last 10 days. We are concerned that comments from PPG, HON and SHLM may be a leading indicator of weak demand and more negative revisions through the balance of the year – more because of an inventory shift than because of a broad drop in consumption – Europe is possibly a risk from a consumption perspective – see our earlier note on Brexit. We would be cautious generally around the sector because of this risk, and reiterate that we see RPM as a place of relative safety. 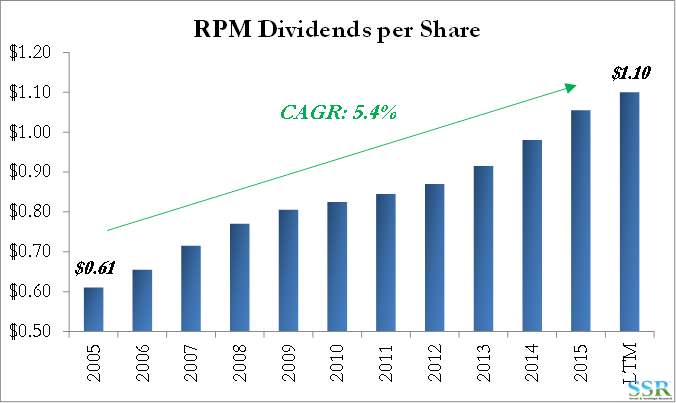 RPM raised its dividend this week by 9% and has been consistent in raising its divided – Exhibit 15. 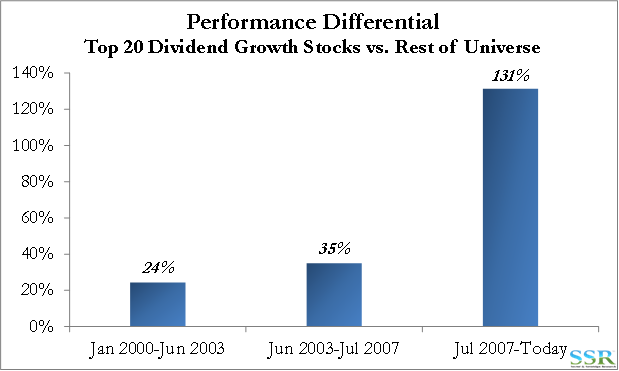 We have shown in prior work that companies with strong dividend growth track records outperform the rest of the group within Industrials and Materials – Exhibit 16. This would be another reason to consider RPM today.